There’s already good news. The new ordinance is expected to bring a boost in business for Austin Community Design & Development Center (ACDDC), which operates the Alley Flat Initiative in partnership with the Guadalupe Neighborhood Development Corporation and UT’s Center for Sustainable Development. A nonprofit program, the initiative uses grants and a design catalog to make ADUs known as “alley flats” affordable for homeowners. Alley flats must be affordable for the first five years. Renters must have an income below 80% of the median family income and their costs to live in the flat can be no more than 28% of their income. Alley flats must also meet the green requirements of the Austin SMART Housing Program. ACDDC employees expect the initiative to grow quickly. 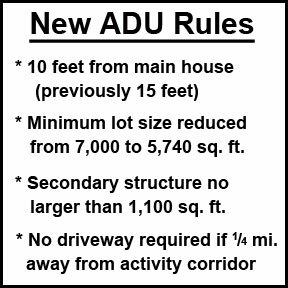 They say in the past they have had to turn potential alley flat customers away because their lots were too small to meet the requirements for ADUs. They are now reconnecting with those customers. Michael Gatto, co-founder of ACDDC, says, “Our goal is that in the next six months or so that we have 10 alley flats completed, and the following year we do another 16 and the year after that we do 40. Other benefits of ADUs are they basically double the density of a property. Gatto says, “When you increase the density like that there are many community benefits. You reduce vehicle miles traveled, which improves traffic. You can also enhance the social fabric by having more neighbors closer to each other and you increase the social space and enliven and activate an alley that was perhaps not used for much other than trash pickup before,” says Gatto. He also points out that there are health benefits to urban density. “Reducing vehicle miles reduces pollution, and if you’re in a walkable neighborhood and you’re walking to the grocery store or walking to some other service provider instead of driving that’s healthier for you,” says Gatto. One family ACDDC has designed an alley flat for is the Kapasis. They started renting out their two-story, two-bedroom alley flat in East Austin last November. Click below to watch their Keep Austin Affordable story. Alley flats typically cost homeowners $100,000 to $160,000 to build, depending on the size and features. Initially, homeowners usually make $250 to $600 income monthly depending on the number of bedrooms and financing costs. I am sorry I am just responding to your message. I will add you to our email list to receive our monthly newsletter. Also, you can find out more about us from our Crossroads Housing booklet Keep an eye on our Facebook page, newsletter and calendar to find out about upcoming events. Thank you for your interest in HousingWorks Austin.